The post production supervisor has a project management role to ensure the completion of the film. The role requires liaising between producer, director, editors, accountants and other post production staff to ensure budgets are met and timelines are completed. 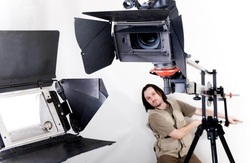 In smaller films they may get involved in advising on post production issues to the director during filming. They also have a responsibility for hiring staff for post production work. This is a highly stressful role and requires, tact, excellent communication and persuasiveness skills. You will also need the ability to make tough decisions and motivating people to consider budgets and deadlines.